Celebrating 40 Years of Ballerina Küchen. Based in Rödinghausen, Germany, Ballerina Küchen celebrates its 40th anniversary this year. Founded in January 1978, Ballerina has always distinguished itself with its high quality products, sustainable business model and the close relationship it maintains with its dealers. 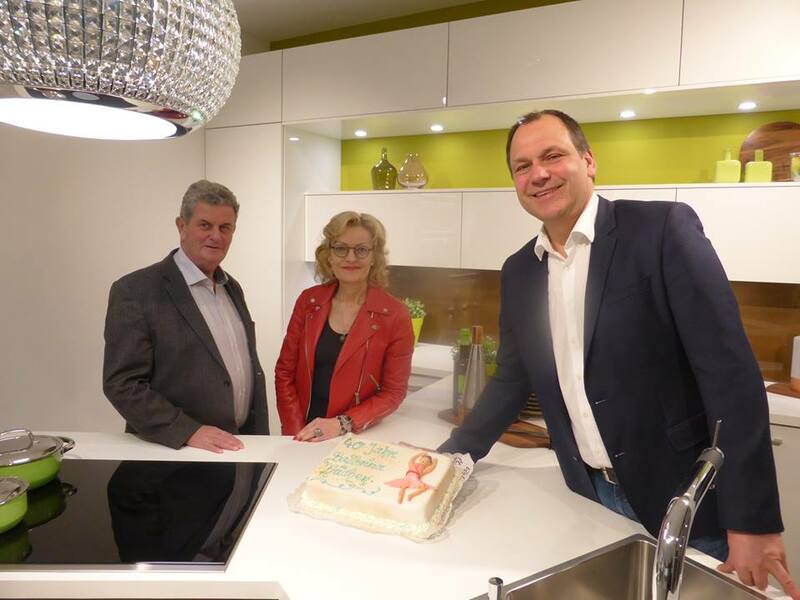 (L-R) Ballerina Founder Heinz-Erwin Ellersiek celebrates with Company Directors Heidrun Brinkmeyer and Heiko Ellersiek. Indeed, Mr Ellersiek has much to be proud of. For over four decades now, Ballerina has produced individually designed kitchens, over half of which are exported to feed growing global demand. With a yearly turnover of almost 84 millionEUR, Ballerina focuses on mid-to-high-end kitchen design, building partnerships with kitchen specialists who appreciate modern design ethos, high-quality materials and the German workmanship that goes into each Ballerina product. Ballerina has grown steadily over the years, thanks mainly to its excellent staff and the commanding position it holds within the market. Starting with just 17 employees and a production floor of 2,500 sqm in 1978, Ballerina today employs 320 permanent staff members and produces 25,000 kitchens each year on a production floor exceeding 30,000 sqm. Ballerina's production facilities at Rödinghausen, North Rhine-Westphalia, Germany. All at Ballerina know that the company's success rides on the motivation and competence of its employees. Having the best trained staff is of vital importance and the company sets high value on training and nurturing young talent; for over 40 years, all apprentices have been taken on a permanent employment contract following completion of their studies. Over the years the company has invested in numerous new production techniques and has expanded the production area considerably. In 1994 the initial production floor was expanded by 11,000 sqm to meet rising demand. This was followed in 1999 with the construction of a second factory, where Ballerina's worktops and panels are produced. Five years later, in 2004, a third factory was completed; here, the carcases integral to each design are cut and processed. The company continues to grow today with investments of €16 million planned in the near future. Plans include the opening of several new production lines, a high-tech expansion of the IT and processing departments and the installation of an automated storage system to increase efficiency on the factory floor. Today the company sits firmly at the forefront of the German kitchen industry. Ballerina's position is reflected by the numerous awards it has received in the last years; it counts among its many accolades the German Design Award 2018, the BMK innovation award in 2012, 2013, 2014 and 2015, as well as the Küchen Award 2014/2015 and 2016/2017 by the publishing group Markt-Intern. But in spite of its growth and success, Ballerina remains a family business at heart. Mr Ellersiek is as passionately involved today as he ever has been, and he has been joined over the years by Heidrun Brinkmeyer (Director of Sales & Marketing) and Heiko Ellersiek (Technical Director- no relation). And with Ballerina's shares split between its two directors and the Ellersiek family, the company's future is in safe hands. We look forward to seeing where the next forty years will take them. https://www.youtube.com/watch?v=WqivFEbSaRE&t=22s For more details of Ballerina's unique range of kitchen furniture, please visit their page . To learn more about becoming a retailer of Ballerina furniture, please visit Patrick House Group at our website.